 Tomahawk T-shirts was founded nearly 20 years ago as a monogramming company. Over the years we added computerized embroidery capabilities, a full service screen printing operation, complete graphic services and the full array of promotional products. We are a full service, one stop shop for all your promotional needs. We have worked with major corporations, government organizations, schools, teams, small restaurants and clubs to provide the perfect garment, pen, koozie or other product to help their promotional goals. We produce every job to satisfy the specific needs of the customer. We do not stock a large inventory. We order our stock to your individual requirements. All garment decoration is still done in-house to our exacting quality standards. Any item which advertises your business or organization is a promotional product. Tomahawk can help you choose from among an almost unlimited variety of products to make your promotional campaign a success. Browse our supplier catalogs to see some of the thousands of items available or call our customer service department for help in narrowing your search.